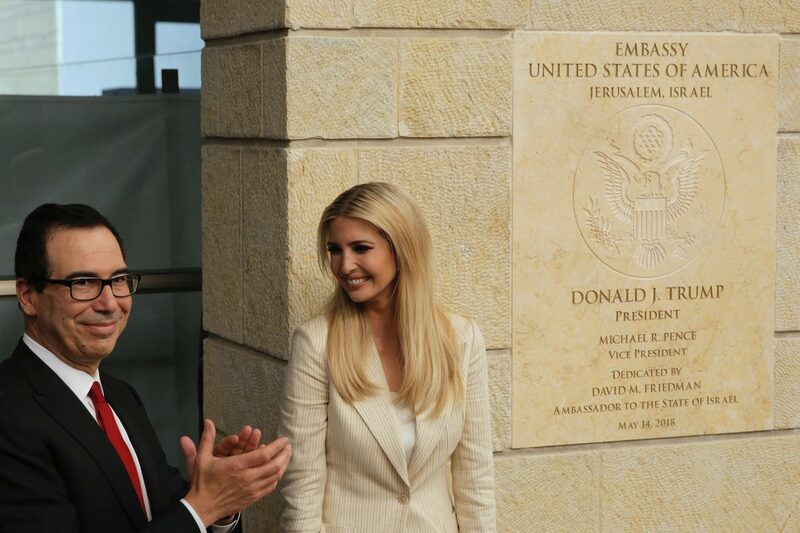 By Miriam Valverde on Monday, January 16th, 2017 at 11:00 a.m.
Ivanka Trump and U.S. Treasury Secretary Steve Mnuchin attend the opening ceremony of the new U.S. embassy in Jerusalem, Monday, May 14, 2018. By Manuela Tobias on Monday, May 14th, 2018 at 11:09 a.m.
President Donald Trump made good on his promise to move the U.S. embassy to Jerusalem. The administration unveiled an interim embassy in a U.S. consular building in Jerusalem on May 14, 2018. "Today we officially opened the United States embassy in Jerusalem. Congratulations. It's been a long time coming," Trump said in a recorded video message. "For many years we failed to acknowledge the obvious, the plain reality that Israel's capital is Jerusalem." Ivanka Trump and her husband Jared Kushner, both White House advisers, attended the ceremony alongside Treasury Secretary Steven Mnuchin and Deputy Secretary of State John Sullivan. The opening coincided with the 70th anniversary of Israel's establishment. U.S. Ambassador to Israel David Friedman and a few staff members are the only ones making the move. Most diplomats will continue to work from Tel Aviv until a larger site is found. In a recorded video message Trump pledged commitment to facilitating a lasting peace agreement between Israel and Palestine. However, Palestinians and European allies view the embassy move as a step in the wrong direction for a peace deal. The announcement was overshadowed by thousands of Palestinian protesters in Gaza, dozens of whom were killed. By Allison Colburn on Wednesday, December 6th, 2017 at 3:25 p.m.
President Donald Trump has taken a major step toward his campaign promise to move the U.S. embassy in Tel Aviv to Jerusalem. Trump announced the move and formally recognized Jerusalem as Israel's capital in prepared remarks at the White House. "My announcement today marks the beginning of a new approach to conflict between Israel and the Palestinians," he said Dec. 6. The policy change stems from a 1995 law mandating the embassy be moved to Jerusalem by 1999. However, out of worry that the move would destabilize peace talks between Israelis and Palestinians, presidents Bill Clinton, George W. Bush and Barack Obama have signed waivers to suspend the move. "While previous presidents have made this a major campaign promise, they failed to deliver," Trump said. "Today, I am delivering." Trump said he would direct the State Department to begin preparations for a moving process that will include "hiring architects, engineers and planners, so that a new embassy, when completed, will be a magnificent tribute to peace." During the first several months of his presidency, it was unclear if Trump would indeed follow through. The White House said on June 1 that Trump had signed a waiver under the Jerusalem Embassy Act to postpone the embassy's relocation. A president must sign the waiver every six months in order to suspend the relocation, a rule that is outlined in the 1995 law. And during his first trip to Israel as president, he did not announce the embassy relocation, as some had expected he would. This angered Israeli officials. The pledge looked on hold in October, when Trump said he wanted to first try to make peace between Israel and Palestine before moving the embassy. During his announcement on the new policy change, Trump said he wanted to make clear it "is not intended, in any way, to reflect a departure from our strong commitment to facilitate a lasting peace agreement." East Jerusalem, home to some of the holiest sites of Judaism, Christianity and Islam, is disputed territory. Israel annexed East Jerusalem during the 1967 war. The UN Security Council considers Israel's settlements in East Jerusalem to be in violation of international law. The United States' decision to recognize Jerusalem as Israel's capital sparked protests in Palestine and received praise from Israeli Prime Minister Benjamin Netanyahu. Trump called for peace and calm in the wake of his announcement. This is a big step toward his goal. However, until the move to Jerusalem is final, we'll continue to rate this In the Works. By Allison Colburn on Monday, October 9th, 2017 at 12:46 p.m.
President Donald Trump further distanced himself from his campaign promise to move the U.S. embassy in Israel from Tel Aviv to Jerusalem. During an interview on the Trinity Broadcasting Network, Trump told former Arkansas Gov. Mike Huckabee that he wants to first try to make peace between Israel and Palestine. "I want to give that a shot before I even think about moving the embassy to Jerusalem," Trump said on the Christian network interview. "If we can make peace between the Palestinians and Israel, I think it'll lead to ultimately peace in the Middle East, which has to happen." In June, Trump signed a waiver on the Jerusalem Embassy Act of 1995, which mandates that the embassy be moved to Jerusalem by 1999. Past presidents have also waived the act out of concern that it would derail peace talks. A White House statement on the waiver said Trump still intends to follow through on his promise. It was not a matter of "if that move happens, but only when," the statement said. David Friedman, the U.S. ambassador to Israel, echoed the White House's long-term strategy during an interview on TBN a few days before Trump's sit-down with Huckabee. "The embassy will move. It's not if, but when," Friedman said. "And I am convinced that during his term, the United States will recognize Jerusalem as the undivided and eternal capital of the state of Israel." When Huckabee asked Trump, in light of Friedman's comments, for a timeframe on the move, Trump said the decision would happen in the "not too distant future." Trump has not backed off of his promise, but his recent remarks on the subject show he is facing substantial roadblocks and cannot say when the embassy will move. We'll continue to rate this Stalled. By Miriam Valverde on Friday, June 2nd, 2017 at 10:51 a.m.
President Donald Trump has delayed moving the U.S. embassy in Tel Aviv to Jerusalem. The White House issued a statement on June 1 saying Trump had signed a waiver under the Jerusalem Embassy Act postponing the embassy's relocation. But that doesn't mean he's changed his mind about it. "No one should consider this step to be in any way a retreat from the president's strong support for Israel and for the United States-Israel alliance," said the White House statement. The decision was made to "maximize the chances" of a successfully negotiated deal between Israel and the Palestine, and that fulfills the president's obligation to defend America's national security interests, the White House said. The Jerusalem Embassy Act of 1995 mandated that the embassy be moved to Jerusalem by 1999. Past presidents have also signed waivers delaying the move out of concerns that it would upset peace talks between Israel and Palestine. Trump remains committed to moving the U.S. embassy in Tel Aviv to Jerusalem, but that's not happening for now. We rate this promise Stalled. By Amy Sherman on Tuesday, May 23rd, 2017 at 4:13 p.m.
During his first trip to Israel as president, Donald Trump made no effort toward his campaign promise to move the American embassy from Tel Aviv to Jerusalem. That angered Israeli officials, who said that Trump had gone back on his promise. Michael Oren, a former Israeli ambassador to the U.S. who now serves as deputy minister for diplomacy in the Netanyahu government, told reporters in a May 23 conference call after Trump's visit that he was disappointed that Trump didn't talk about moving the embassy. PolitiFact asked Oren in an email if there had been any private communication. "What's private is private," he replied. "There was no public statement." During the presidential campaign, Trump repeatedly said he would move the embassy to Jerusalem. "They want it in Jerusalem," Trump said in a January 2016 interview. "Well I am for that 100 percent. We are for that 100 percent." In February 2017, at a joint press conference with Israeli Prime Minister Benjamin Netanyahu, Trump expressed cautious interest about moving the embassy but provided no timeline. "I'd love to see that happen," Trump said. "We're looking at it very, very strongly. We're looking at it with great care, great care, believe me. And we'll see what happens. Okay?" We gave Trump an In the Works after his comments. But in the weeks leading up to Trump's visit to Israel, news reports indicated that talk of moving the embassy was on the backburner amid concerns that it could harm the peace process and inflame the Arab world. Secretary of State Rex Tillerson sounded cautious about any such move in an interview that aired on NBC's Meet the Press on May 14. "The president is being very careful to understand how such a decision would impact the peace process," Tillerson said. Tillerson also said that Trump would make the decision based on feedback from all parties in the region including "whether Israel views it as helpful to a peace initiative or perhaps a distraction." News outlets including the New York Times and CNN reported that Arab leaders, including King Abdullah II of Jordan, cautioned against moving the embassy. Jerusalem is disputed territory between Israelis and Palestinians. Most of the city lay inside Israel's border, but during the 1967 War, Israel annexed East Jerusalem. If the United States moves its embassy to Jerusalem, that would be viewed as endorsing Israel's view and would anger Arab leaders. In 1995, Congress passed a law mandating the embassy be moved to Jerusalem by 1999. But U.S. presidents have signed waivers to suspend the move because they have feared it would disrupt peace talks between Israelis and Palestinians. The deadline for Trump to sign the next semiannual waiver is June 1. Trump still has years to deliver on this promise, but it appears to be on the backburner for now. By Jon Greenberg on Wednesday, February 15th, 2017 at 6:25 p.m. In a joint press conference with Israeli Prime Minister Benjamin Netanyahu, President Donald Trump spoke cautiously about the future location of America's embassy in Israel. During the presidential campaign, Trump told the American Israel Public Affairs Committee, "We will move the American embassy to the eternal capital of the Jewish people, Jerusalem." But when asked by a reporter at the press conference if he would fulfill that promise and if so, when, Trump was less definitive. "I'd love to see that happen," Trump said on Feb. 15, 2017. "We're looking at it very, very strongly. We're looking at it with great care, great care, believe me. And we'll see what happens. Okay?" Trump could have said "Yes," to the first part of the question and left the moving date open. He didn't. We reached out to the White House for an explanation and a spokesman repeated that the administration is taking a hard look at the issue. Two days before the press conference, Sen. Bob Corker, R-Tenn., chair of the Senate Foreign Relations Committee telegraphed that the president might hold back. In an interview with Politico, Corker said the administration had been ready to order the embassy to move as soon as Trump took office. But that view shifted. "The one plus in the Iran deal is it brought the Arab community close to Israel," Corker said. "When you've got a situation like that, do you really want to destroy this alliance that is unprecedented and is real?" Jerusalem is disputed territory. Most of the city lay inside Israel's border but during the 1967 War, it annexed East Jerusalem. Many nations don't accept that status. For the United States to unilaterally throw its weight behind the idea that Jerusalem is the seat of the Israeli state would inflame the Arab world. Corker argued that now was not the time to upset Israel's Arab neighbors. Trump held back from promising to move the embassy. But he did say it was still an option. We rate this promise as In the Works. On the campaign trail, Donald Trump praised Israel as one of the United States' greatest allies, which is why he is promising to move the embassy in Israel to Jerusalem from Tel Aviv. "We will send a clear signal that there is no daylight between America and our most reliable ally, the state of Israel," Trump said after promising to move the embassy at his speech for American Israel Public Affairs Committee. "The Palestinians must come to the table knowing that the bond between the United States and Israel is absolutely, totally unbreakable." On the campaign trail, Trump praised Israel, and sees moving the embassy as an important part in making Jerusalem the official capital of Israel. In 1995, Congress passed a law mandating the embassy be moved to Jerusalem by 1999. But U.S. presidents have signed waivers to suspend the move, amid fears it would destabilize peace talks between Israelis and Palestinians. Because of the 1995 law, Trump could initiate the move on his own by not signing waivers like former presidents have done. Logistically speaking, moving the embassy would not be a problem, said Ido Oren, a political science professor at the University of Florida. He said construction may take a few years but in the meantime a section of the existing U.S. consulate in West Jerusalem could be designated an embassy. He also said office space could be rented elsewhere for a few years. The real problem is the politics surrounding the move, which could potentially derail his promise. Chuck Freilich, an International Security Program senior fellow at Harvard University, said moving the embassy could lead to an uproar in the Arab and Muslim worlds, if not done as part of some agreed framework, like a peace agreement with the Palestinians. Oren said that might be enough to keep Trump from following through. "Some of his advisers as well as the professional diplomats of the State Department will likely warn him that such a move might trigger a new Palestinian uprising, further antagonize the Arab and Muslim worlds, undermine the objective of fighting the Islamic State, etc.," he said. Trump could trigger a move by failing to sign a waiver to the 1995 law. The current U.S. consulate in Jerusalem could serve as a temporary embassy facility.